Our electrical outlet covers stop drafts from entering your home. Pays for itself within 3 months of use. Our Weatherization Products Help You Green Your Home, Stop Drafts, and Lower Your Energy Bills! We manufacture Green Weatherization Home Energy Conservation Draft Stopper Products in the U.S.A. Our products help stop drafts, reduce your energy bills, save you money, and improve the comfort of your home. We sell direct to you - buy from the manufacturer. ATTENTION CONTRACTORS - SAVE ON BULK ORDERS FROM OUR CONTRACTOR PAGE! Email us for Log-in Details! Chimney Plug, Fireplace Plug, Whole House Fan Shutter Covers, Battic Door® R-50 Attic Stair Covers, R-42 and R-50 E-Z Hatch® Attic Access Scuttle Doors, Dog Pet Doors, Dryer Vent Seals, Radon Test Kits, Air Conditioner Covers, Recessed Light Covers, Insulated Switch and Outlet Plate Covers, Stick N Seal Gaskets For Use With Your Switch and Outlet Plates, Insulated Crawl Space Vents, Premium and Economy In-Line Duct Back Draft Dampers, Home Energy Monitors, and more! Our green home energy star weatherization products SAVE YOU MONEY ON YOUR ENERGY BILLS by reducing drafts and air-leaks around often overlooked "holes", including the attic stairs, the attic scuttle access door, the whole house fan, the fireplace, the clothes dryer, the air conditioner, switch plates, recessed lights, the bathroom, kitchen, clothes dryer exhaust fans, pet door, crawl space vents, and more! Use our energy monitor to measure your energy savings! By sealing these air leaks, our products reduce cold drafts and heat loss in the winter, as well as air-conditioning loss in the summer. Our weatherization products green your home, conserve energy, lower your utility bills, reduce noise and pollutants, improve indoor air quality, reduce the chance of ice dams and attic mold, and improve the comfort of your home. Our products are MADE IN U.S.A.! We ship direct to customers, and sell in bulk to builders, weatherization contractors, and distributors. "The Battic Door® made a HUGE difference. Thanks again for your product!" --Doug K.
"We have friends that bought your stair cover and R-50 kit, you come highly recommended!" --Andrew B. "I purchased the Battic Door® attic stair cover. I can't believe the difference it makes! The furnace does not turn on NEARLY as often as it did before. Great product, and worth every penny!" --Felix F.
"The attic stair cover solves a heat loss problem very effectively. The extra insulation, reflective cover, and foam seal complete the deal. I had it in place within about 15 minutes of receiving it. " --William Z. "This may be the best 120 bucks I've ever spent. I can't believe what a difference the stair cover has made in my heating oil usage! I live in Southern Maine. I installed the stair cover early in November. I am writing this in mid-January. Normally during this part of winter, I would have gone through about 550 gallons of heating oil since that time (2 fill ups on the oil tank). I would say I've gone through more like 300 gallons. At about 2.60 a gallon, that's a savings of over $500. Now, my house is only about 18 years old, and fairly well insulated otherwise. That having been said, I am astonished that something so inexpensive, simple in design and easy to install could result in such a huge savings. Oh, the house feels much warmer, too. I noticed the difference right away, especially in the upstairs hallway where the pulldown attic stairway is. " --Chip A. "We need to order 5 of the 25x54 R-50 stair covers. We have had great luck with these. We recently had an audit from D.O.E. on some of our houses. The DOE officials liked the stair covers. Thanks!" --Harry H.
Re: Battic Door® Attic Stair Cover: "What a superb idea! I am amazed at your design and ingenuity. It is one of those ideas that is as nifty and applicable as the hand potato peeler! Thank you very much for an easy, functional piece of equipment." --Bill B. "I received my Battic Door® and covered it with insulation. It was easy to put together and fit perfectly. Thanks for a terrific product!" --Bill P.
"Thank you for the same day shipping on my Order and answering my question right away. The R50 is an Elegantly Simple Design with Complex Results. It is a high quality product that is quick and easy to install." --Curt B. "Hello, just wanted to let you know that we did receive the Fireplace Draft Stopper. We installed it immediately. We can't believe how well it works!!!! We don't have any more smell in our house. Thank you so much for solving our problem. We have been telling everyone about your products." --Michael E.
"I received both my Fireplace Draftstopper and Battic Door® Attic Stair Cover. Easy to install and Fireplace Draftstopper is really great !!!! My neighbor and I were both impressed. Also, I gave information to one of the board members of our development to look at." --Michelle E.
"Thank You for your quick reply. With the high price of natural gas this winter your Fireplace Draft Stopper was a god send. Thanks again and I have recommended your product to many of my friends and acquaintances." --Bob K.
"I saw the Fireplace Plug on ABC TV this morning. Been looking for something like this for years!" --Edene B. "Received the fireplace draftstopper and my wife installed it within 15 minutes. So far we can tell a difference in that the amount of draft has been reduced and the floor in that room is no longer colder than the rest of the room. So far so good, thanks for your quick response!" --Bernie M.
"Awesome products! I am so glad I found your website. I have noticed my air conditioner doesn't kick on as often. Yor website was very informative and easy to find, I just typed attic fan cover into my MSN search engine and found your website. The person I talked to was very helpful and kind when I called to place my order. Two thumbs-up for you guys!!" --Emily H.
"Thank you for my order for the Whole House Fan Shutter Seal. When I had my house built in 2001 I had a whole house fan installed and have been searching unsuccessfully ever since for an insulation cover. Over the last 4 years I have periodically searched on the internet for a cover and the closest I ever came were instructions for a do-it-yourself design. I wanted something that would like nice inside the house so I kept on looking for a ready-made kit. I did a Google search yesterday and was delighted to find the product offered by your company. I am glad I finally found you guys. I'm looking forward to receiving the shutter seal kit and installing it this weekend before the heating season starts. Thanks again." --Dave P.
"What a product. Simple concept but super effective. The effects were immediate, that very evening and the morning were awesome and not a walk in freezer. Who knew that a draft from the fireplace was that significant. Thanks again for making the Fireplace Plug!!" --Robert L.
"The Fireplace plug is just what I'm looking for. I'm gonna order tonight. Appreciate the quick response....finally Customer service! Don't get to see that everyday." --Scott K.
R-42 and R-50 E-Z Hatch® Attic Access Scuttle Door Meets The New Energy Code Requirements! Battic Door® R-50 Attic Stair Insulator Cover Meets The New Energy Code Requirements! 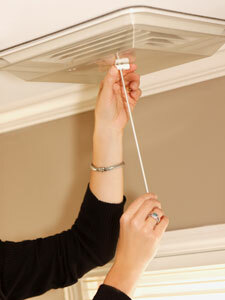 Save $100's on your energy bills! Saves Up To 10% on Energy Costs! Creates perfect 90 degree elbows! Wrap’R-Grab’R® AUTO – A Patent Pending Stylish Waste Bin for the Car. It fits in any car, truck cup holder.